“I love my teachers because they love me and teach me many things,” seven-year-old Limber told us, when we recently visited him in his family home. We went to see him to celebrate his recent graduation from the Early Childhood Development (ECD) classroom to grade one, and to speak to him and his parents about his success at school. 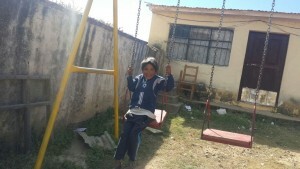 Seven-year-old Limber in his classroom in Sojta Phata, Bolivia. As one of seven children from a farmer family that is just trying to survive, his graduation is a big achievement. Limber lives in a rural community in Bolivia that is located two hours away by dirt road to the nearest city of Sucre. He and his six siblings live with their parents in a small home, made of bricks and clay. Both of his parents work hard for the family to live off of what they produce in the fields. His family is warm and welcoming, and despite not having much to offer they have a big heart for visitors. For Limber and his family, the ECD classroom at school and his teacher Ms. Karina have been a lifeline. Giving Limber somewhere safe to go during the day while his parents work in the fields, and giving him the opportunity to develop early childhood skills, has helped set him on the right path to be able to pursue a different future if he chooses than his parents. 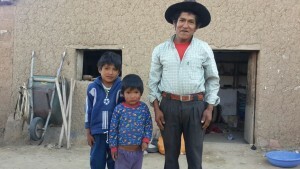 Limber (left) standing outside the family home with younger brother Marcelino and father Zacarians. As a participant in CFTC’s Sponsor a Child program, Limber and his family benefit from having his school supplies and other basic needs provided for. Limber and his classmates also receive nutritious meals at school, which has helped him develop and focus on learning, and has relieved his parents of providing an extra meal for him each day. Limber’s parents, along with others, have been able to participate in CFTC-funded workshops on childhood nutrition and other important topics. Ms. Karina – Limber’s dedicated teacher – has been trained and supported by CFTC to specialize in Early Childhood Education so that he and his classmates are given the best opportunity while learning in school. Limber enjoying time spent outside at school. For a child from a remote community like Limber’s, having a trained teacher and dedicated resources can make all the difference. For Limber, it has meant that his most formative years were spent in a warm and loving classroom, where he has been able to grow and pursue his dreams – whatever they may be. We know that with our donors continued support, Limber will continue to make his parents, his teacher and his community very proud.